These 15 pharmaceutical companies are ranked by their market capitalization for the latest date that they furnished a figure for their numbers of outstanding shares and a year-ago figure for the same. We’ve given last year’s Top 10 Pharma Firms list an update. 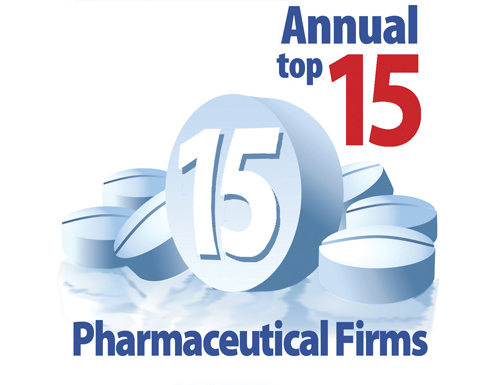 Last year, we gave you the top 10 pharma firms; this year, we turn the volume up to 15. Following is a list of 15 pharmaceutical companies, ranked by their market capitalization for the latest date that they furnished a figure for their numbers of outstanding shares and a year-ago figure for the same. Pharmas, as with the biotechs listed in this space last week, benefited from the stock market surge that lifted share prices by mostly double-digit percentages over the past year. However, none of the 15 top pharma companies listed here had been able to double their market cap year-over-year; by contrast, five biotechs saw their market cap more than double over a 12-month period. Investors rewarded pharmas that performed well, though not as handsomely as biotechs that delivered. Another factor in the lower market cap increases of pharmas compared with biotechs was the fact several of the companies were in the middle of restructuring efforts announced in earlier years, mostly related to loss of patent exclusivity on older blockbuster drugs. As reflected by GEN’s recent list of Top 15 Job-Cutting Companies of 2013 (So Far), pharmas carried out more job-cutting in the first half of 2013 compared with 2012. The past year also saw some flux among the companies listed. Of this year’s top 15 (the 2012 GEN List of top pharmas included only 10 companies), two pharmas climbed up the list (Novartis and Sanofi); four slipped a notch or more (Roche, Merck & Co., GlaxoSmithKline, and AstraZeneca); three companies were ranked the same as last year; five were ranked for the first time (Bayer, Eli Lilly, Takeda, Astellas, and Daiichi Sankyo); and the remaining company (AbbVie) didn’t exist last year, rendering comparisons to 2012 moot. Market cap is calculated by multiplying the number of outstanding shares by the share price. In some cases, companies furnished market cap figures directly, though usually rounded off. U.S. companies generally report their numbers of outstanding shares in their 10-Q quarterly or 10-K annual earnings filings with the Securities & Exchange Commission. Companies based outside the U.S. either disclose market cap directly, or their numbers of shares “in issue” or “in free issue” in half-year and full-year results disclosures. For all companies, closing share prices as of the dates of their outstanding-shares figures can be found through any of several free stock information websites. Figures of non-U.S. companies were converted to U.S. dollars from various currencies. 1 Figures converted to U.S. dollars via www.xe.com on July 17, 2013. 2 Because March 31 was not a trading day in either 2013 or 2012, the closing price immediately preceding the date of share figure has been furnished. 3 Share figures furnished by the company to the nearest thousandth of a million. 4 Because April 20 was not a trading day in 2013, the closing price immediately preceding the date of share figure has been furnished. 5 AbbVie comprises the branded pharmaceutical operations spun out of Abbott Laboratories on January 2, 2013, so a comparison with 2012 is not available or N/A. 6 Company furnishes comparable market capitalization figures directly. 7 Share figures are weighted average number of shares for Q1 of 2013 and 2012, and were furnished by the company to the nearest thousandth of a billion. 8 Because March 31 was not a trading day in either 2013 or 2012, the closing price immediately preceding the date of share figure has been furnished. 9 Because April 29 was not a trading day in 2012, the closing price immediately preceding the date of share figure has been furnished. 10 Figures for numbers of shares disclosed by NYSE Euronext Paris exchange. 11 Company furnishes comparable market capitalization figures directly, but only to the nearest thousandth of a billion and only in its annual and half-year reports. 12 Company furnishes comparable market capitalization figures directly, but only to the nearest tenth of a billion. 13 Share figures are average number of shares outstanding (diluted) during Q2 2013 and 2012, and were furnished by the company in thousands of millions. 14 Because June 30 was not a trading day in either 2013 or 2012, the closing price immediately preceding the date of share figure has been furnished. Hot Spots for Biotech Jobs Outside the U.S.